Battery manufacturer Saft have developed state-of-the-art lithium-ion (Li-ion) batteries that are providing a boost to five of the twelve Formula 1 teams competing this season, including Ferrari and Lotus Renault GP. Saft's Li-ion batteries are at the heart of the Kinetic Energy Recovery System (KERS) that will be deployed by the five teams in response to the FIA regulations that encourage the development of energy-saving technology. KERS also promotes more exciting racing by providing a power boost for overtaking. "Our solutions for KERS demonstrate Saft's ability to deliver leading-edge technology for the most complex and demanding high performance applications, even while working to extremely tight deadlines," says Xavier Delacroix, General Manager of Saft's IBG division. "We are aiming to establish our Li-ion batteries as the reference for Formula 1." The Saft Li-ion battery allows up to 60 kW boost (around 80 horsepower), with an energy release up to 400 kJ per lap. 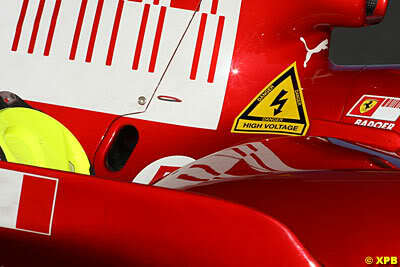 The driver can use this additional power to provide an extra seven-second boost of acceleration in each lap. When the F1 car brakes, a proportion of its kinetic energy is captured by an electric motor/generator (MGU) connected mechanically to the engine. This captured kinetic energy is converted into electrical energy which is stored in the Saft Li-ion cells. When extra power is needed, the battery releases the stored energy to the MGU which functions as an electric motor, providing extra power to the drive train.